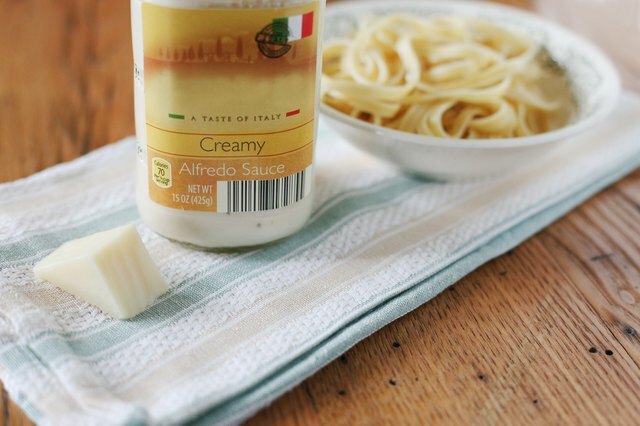 To get your Alfredo sauce to thicken correctly, use the right amounts of Parmesan and cream, and simmer the sauce gently until it is of the right consistency. This recommendation applies to the classic white sauce that most Americans associate with fettuccine Alfredo, which is a mix of cream, butter, Parmesan and often a bit of starch. 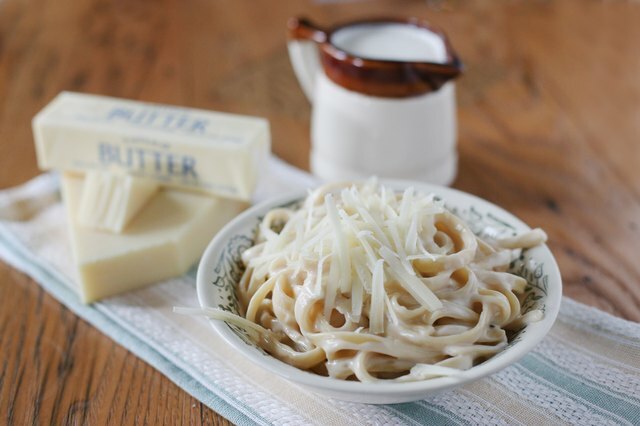 However, the original Alfredo sauce was made with nothing more than butter and Parmesan cheese. The basic white sauce that is associated with fettuccine Alfredo is made with butter, Parmesan cheese and a small amount of cream. To get the sauce to thicken sufficiently, large quantities of grated Parmesan are tossed with hot noodles and butter. The cream adds richness and silkiness to the dish, but does not help the sauce thicken. However, the contemporary version of the sauce is thickened by simmering the cream. 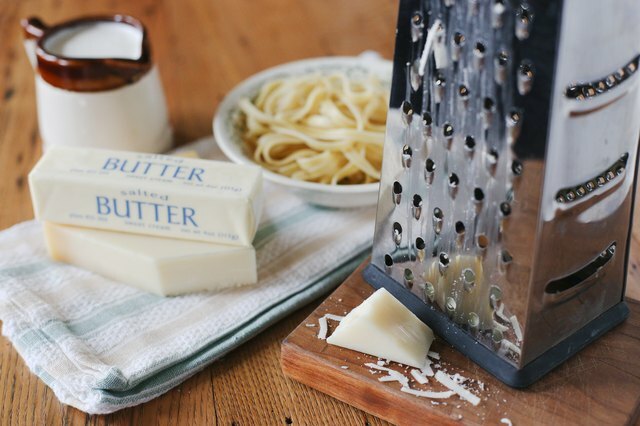 This lets you limit the amount of Parmesan used. 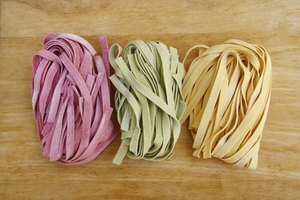 Pasta-cooked water naturally contains starch from the noodles. The liquid from cooking the pasta — often fettuccine — is saved and used to thin the sauce, while the starch adds flavor and, as the sauce cools, helps thicken. However, because the amount of starch in pasta cooking water varies depending on the cooking method and pasta type, powdered starch is sometimes added to help thicken the sauce evenly. Whisk a small pinch of arrowroot or cornstarch into the cream before simmering to ensure even distribution. Serious Eats also recommends using a beaten egg, whisking it in with the cream and starch to help the sauce cling to the noodles. To ensure that the sauce clings to the noodles, add the noodles to the sauce when they are still hot. Whisk the sauce ingredients together — cream, Parmesan and salt, and starch if using. Once the noodles have been drained -- while setting aside some of the cooking water -- pour them into a mixing bowl with the butter. Toss the noodles to coat evenly; the heat of the noodles will melt the butter. Whisk the hot pasta water into the cream and cheese mixture, before quickly pouring it into the hot pot used to cook the noodles. Stir continuously as you heat the pasta and sauce over low heat. The sauce will slowly thicken. Once it is of the right consistency, add your buttered noodles, turning them gently so that the sauce coats the pasta evenly. 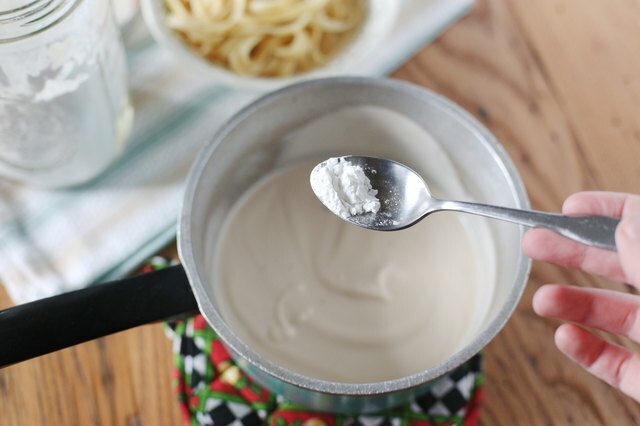 Commercially made Alfredo sauce, the kind you find in jars in grocery stores, uses gums and added starches to create the thick texture of the sauce. 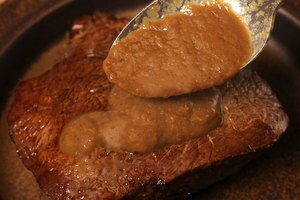 While this creates the desired consistency, it affects the overall taste of the sauce, significantly reducing the richness of the original. In some cases, Alfredo sauce is made with a roux — a flour and butter base used as a thickener — and cream or milk. As the sauce cooks, the roux thickens the sauce. 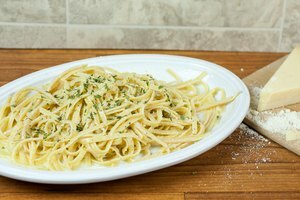 While this variation can be used successfully to produce large quantities of sauce, the texture is often grainier and heavier than the traditional Alfredo.